In June 2015 I was working in the remote Machiguenga community of Yomibato in Manu National Park, Peru. 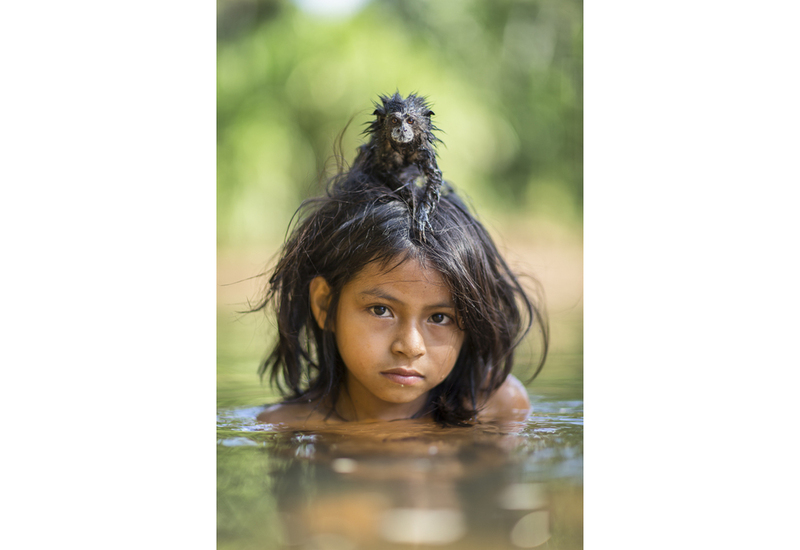 Every afternoon a girl would skip through our camp on the way to the river to take her pet saddle-back tamarin for a swim; so I decided to shoot a portrait of her. Yoina was not impressed with having her photograph taken and the tamarin hated water. To be honest I'm not sure why she took it for a swim, it spent its whole time screaming and trying to clamber onto her head to escape the water. I photographed Yoina on two consecutive afternoons and she only broke a smile for a split second in one of the many shots I took of her. A few months after I left Emma Marris who was writing the article on Manu for National Geographic and Glenn Shepherd and anthropologist who lived in Yomibato and knows the Machiguenga (Matsigenka) well, visited Yomibato and caught up with Yoina. Life had changed dramatically for her since I took the picture and the tale of her monkey was tragic. Editor in Chief Susan Goldberg wrote a short piece about it to accompany the article.